A lookup page from ICAO giving aircraft type codes. Useful for the ICAOTypeCode field in Reporter. A lookup page from the CAA giving details full registration details for all aircraft on the UK Register. CAA homepage for their publication library. This contains a wide range of extremely useful material. NATS AIS site. This will give access to current UK AIP data. EuroControl - Central Flow Management Unit. ATFM (Air Traffic Flow Management) messages. Find it hard to locate a fix in the UK or Ireland? This KMZ file can be opened in Google Earth and you can selectively locate any UK or Irish intersection with a single click. This KML file can be opened in Google Earth and you can selectively locate any UK or Irish navaid with a single click. 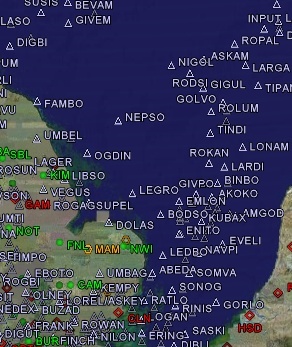 This KML file lists all known UK airports (approx. 1800) with current status and brief history for each. The data is taken from my Catalogue of UK Airports and should be considered a work of reference rather than specifically for SBS use. The JetVision website contains a wealth of useful information for SBS users. This includes the useful Mode S radar site location and SBS users locations. Dave's website contains further tools for SBS users.